According to the American Automobile Association, a record-breaking 103 million people in the United States will travel for the year-end holidays. Although this is the perfect time to celebrate with distant family, it is not the safest time to be on the road. Drunk-driving rates spike over the New Year’s holiday. Also, traffic congestion increases the risk of crashing. In an effort to shave a few minutes off their journey, many road-trippers drive aggressively – and other road users suffer the consequences. A recent report by Kentucky’s WDRB warned that road rage is alarmingly common. In fact, one survey showed that nearly 80 percent of drivers have expressed significant anger or aggression behind the wheel in the past year. What’s more, up to 8 million drivers have allowed their frustration to boil over into dangerous behaviors such as confronting another driver or ramming another vehicle. Matt Troutman is an auto accident lawyer in Louisville who will aggressively represent your interests. Call to schedule a free case evaluation. 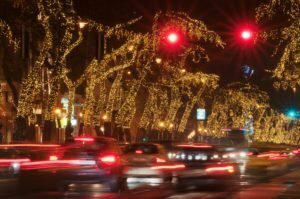 Nobody likes sitting in bumper-to-bumper traffic, but it’s important to remember that gridlock is often unavoidable – especially around the holidays. Agitation can affect a driver’s performance by causing him or her to speed, change lanes without signaling, and tailgate – all of which can contribute to accidents. Try using mantras to help you relax. You can find 33 calming mantras at com. You make physical gestures to communicate your frustration. If you or someone you love was injured by an aggressive motorist, contact a Kentucky car accident attorney from the Troutman Law Office. Matt Troutman has been a practicing personal-injury attorney since 1986, and he has the knowledge and litigation experience to help you recover the maximum compensation. Call to schedule a free consultation with an auto accident lawyer in Louisville.